The nineteen essays that form this pioneering comparative philosophy represent an exchange of ideas among specialists in Neoplatonism and specialists in Indian thought. These scholars have examined concepts and assertions that appear to be common to both philosophical tradition, as well as the possible historical influence of Indian sources upon late Greek philosophy, and specifically upon the Alexandrine Platonists. 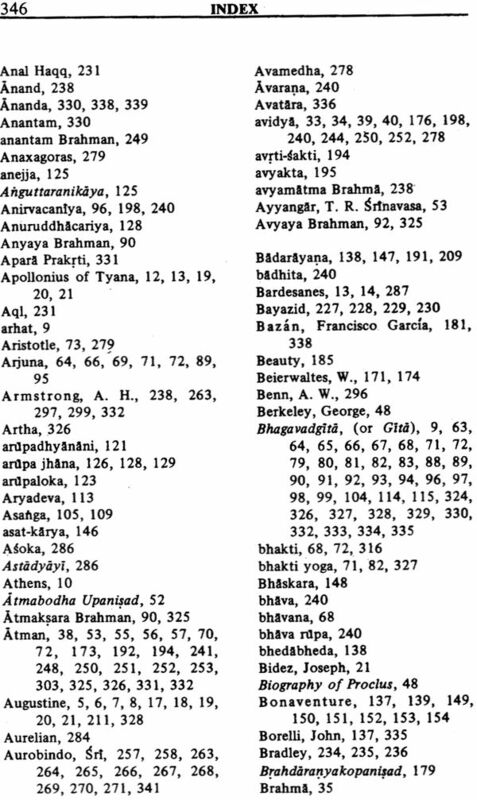 While most of the essays refer to Hinduism, several of them contain general surveys. The essays included are-John J.O. 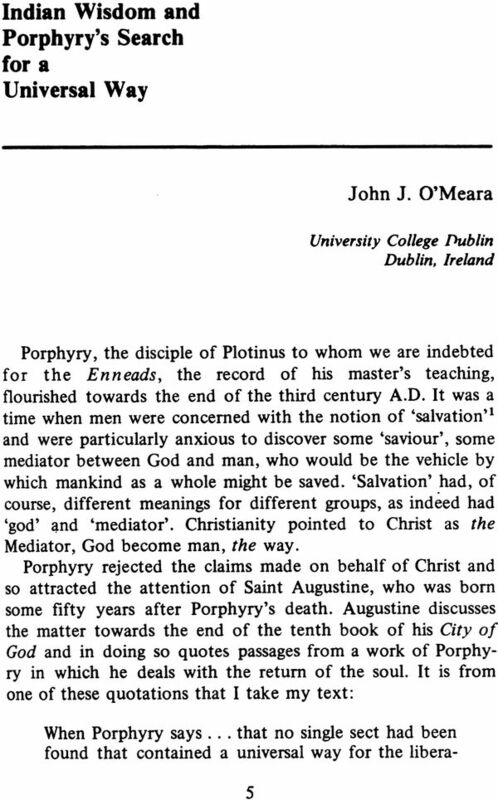 ‘Meara, Indian Wisdom and Porphyry’s search for a Universal Way; Lawrence J. Hatab, Plotinus and the Upanisads; Laurence J Rosan Proclus and the Tejobindu Upanisad; A.H. Armstrong and RR Ravindra, Buddhi in the Bhagvad gita and Psyche in Plotinus; I.C. 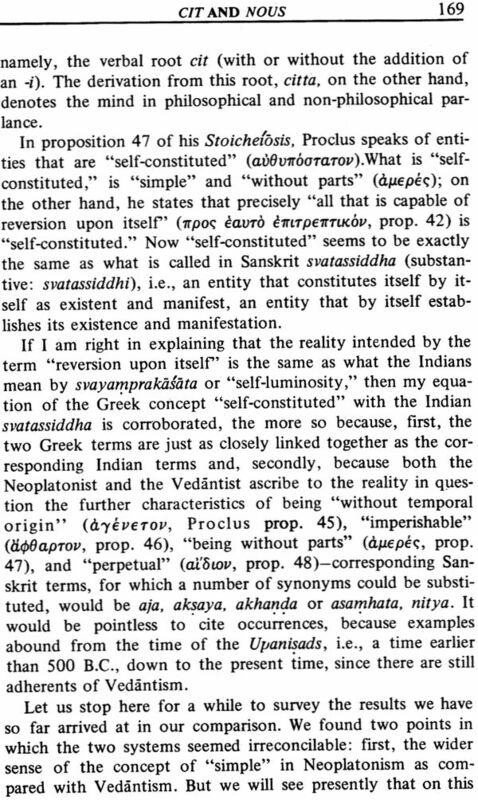 Sharma, The Plotinian One and the Concept of Paramapurusa in the Bhagvadgita; Richard T. Wallis, Phraseology and Imagery in Plotinus and Indian Thought; David F.T. Rodier, Meditative State in the Abhidharma and in Pseudo-Dionysisus; John Borelli, Matter and Exemplar: Difference-in-Identity in Vijnanabhiksu and Bonventure; Paul Hacker, Cit and Nous; Francisco Garcia Bazan, Matter in Plotinus and Samkara; RusseIl Hatton, Samkara and Eriugena on Causality; Mohammad Noor Nabi, Union with God in Plotinus and Bayazid; RK. 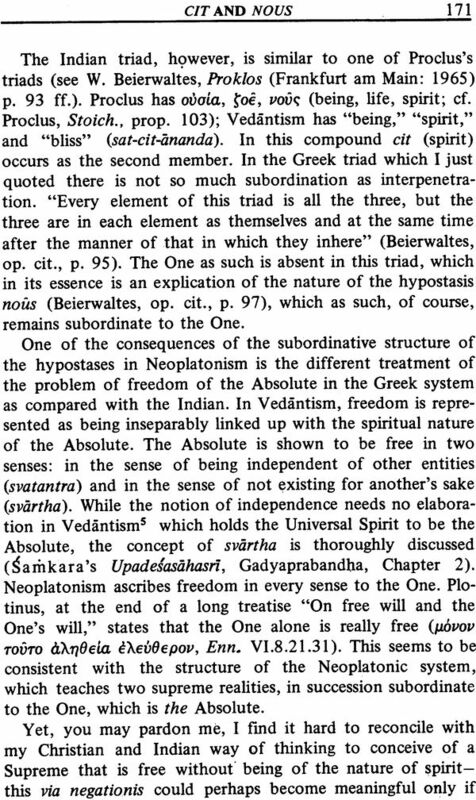 Tripathi, Advaita Vedanta and Neoplatonism; Ramakant Sinari, The Concept of Human Estrangement in Plotinism and Samkara Vedanta; Pritibhusan Chatterji, Plotinus and Sri Aurobindo : A Comparative Study; C.L. 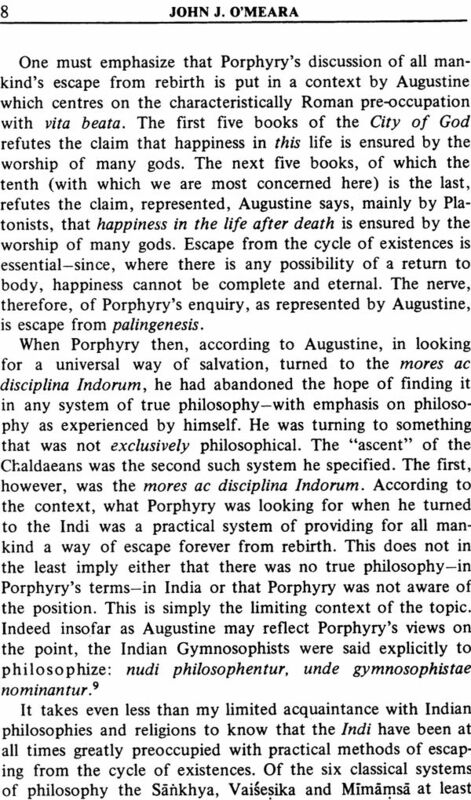 Tripathi, The Influence of Indian Philosophy on Neoplatonism ; Albert M. Wolters, A Survey of Modem Scholarly opinion on Plotinus and Indian Thought, John R A. Mayer, Neoplatonism, Indian Thought and General Systems Theory ; I.C. Sharma, Some Critical Conclusions. 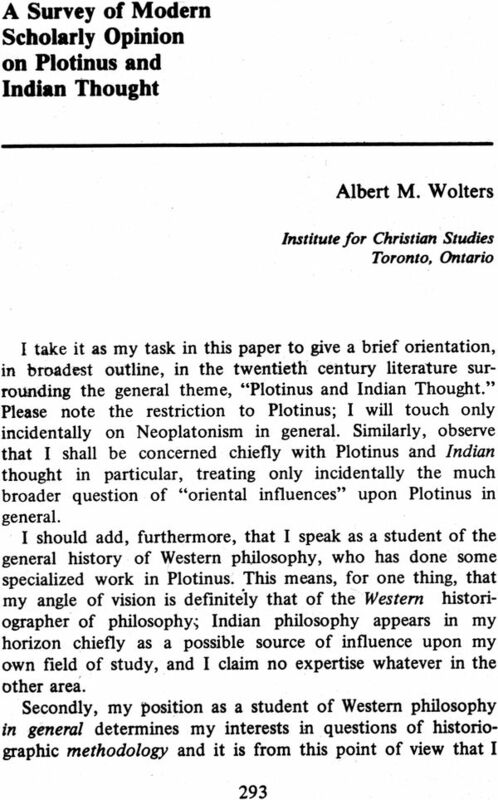 All of the papers in this volume were presented or prepared for presentation at an international conference on “Neoplatonism and Indian Thought” held at Brock University, St. Catharines, Ontario, Canada in October, 1976. The conference was sponsored jointly by the International Society for Neoplatonic Studies and Brock University, and was largely the product of the efforts of Professor John R. A. Mayer of Brock University, who arranged primary funding through the Canada Council, served as eo-chairman of the planning committee, and handled all local arrangements. President Alan Earp of Brock University also gave the project his full moral and financial support. Some one hundred scholars, representing eight nations, participated in the sessions and the conference was judged to be a success by its planners, sponsors, and participants. It stimulated interest in the study of Neoplatonism, a major objective of I. S. N. S., and it continued the long-standing involvement in comparative studies of Brock’s philosophy department. The conference itself, being the first ever held in any country on the subject, was a pioneering venture. Relatively few books and articles comparing the two intellectual traditions have been written. 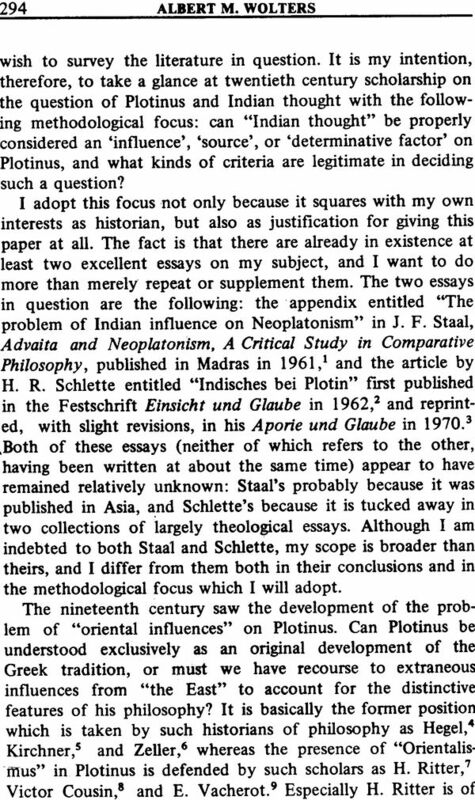 Although a few first rate specialized studies, such as Emile Brehier’s chapter on “L’orientalisme de Plotin” in his La philosophie de Plotin (Paris, 1928) and J. F. Staal’s Advaita and Neoplatonism (Madras, 1961) are avail- able, no major work dealing with the conference theme in a comprehensive way has yet been produced. 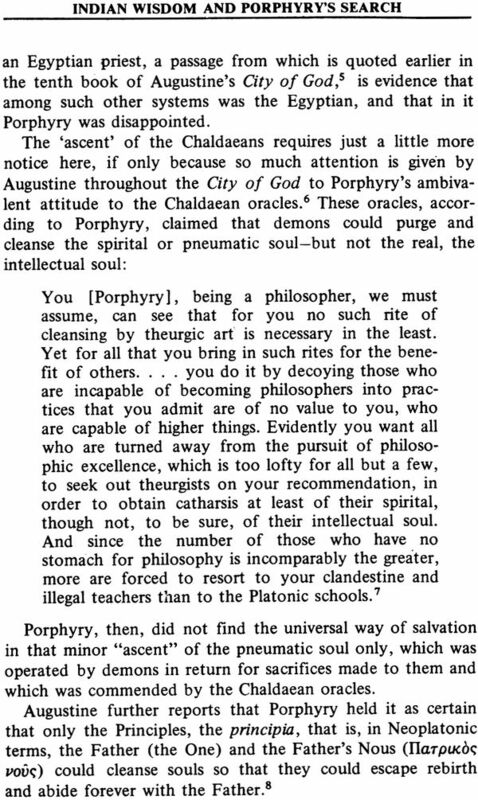 Faced with the fact of the scarcity 0: scholars who are experts in both Neoplatonism and Indian thought, the planning committee decided to have a conference that would allow for an inter change of ideas between specialists in Neoplatonism and specialists in Indian thought. 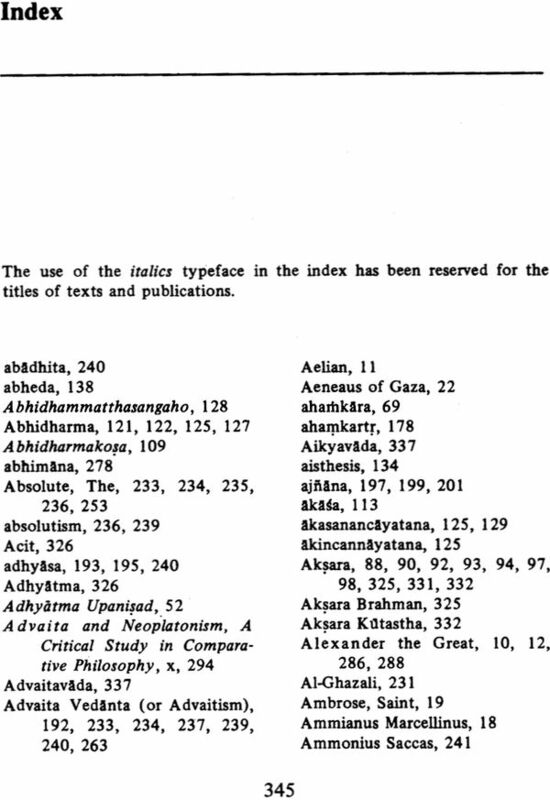 The end result was that most of the papers accepted for the conference were written by experts in the one who were willing to explore some aspect of its connection with the other, and mainly by Western philosophers and classicists willing to investigate Indian thought and Indian philosophers and Western Indologists willing to investigate Neoplatonism. Discussions after the papers were exceptionally lively, and most participants agreed that the sessions were a challenging and creative experience. Two specific objectives were predominant in the minds of the conference planners. The first and primary one was a careful consideration of certain concepts and assertions that appear to be common to both philosophical traditions. Most of the conference papers relate to this objective. 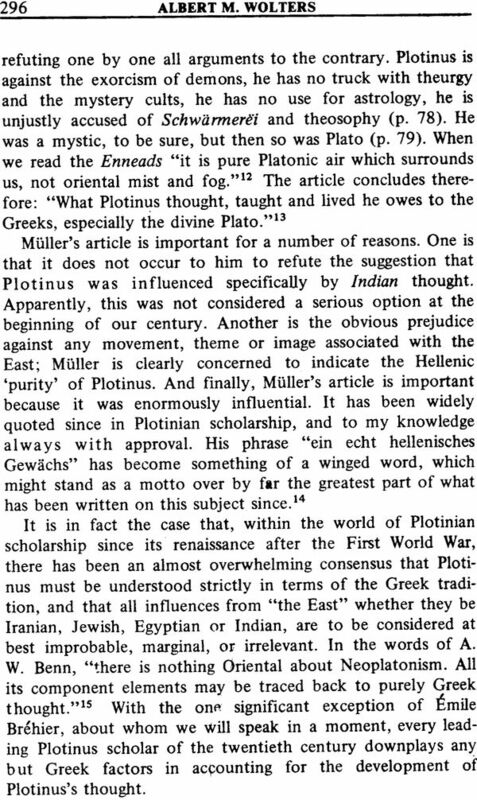 The second and lesser one was an investigation of the possible historical influence of Indian sources upon late Greek philosophy, and specifically upon the Alexandrine Platonists. Although it was our intention to consider all aspects of Indian thought, most of the papers refer only to Hinduism. The conference gave only minor consideration to Indian Buddhism and the Islamic Indian tradition and no consideration to numerous lesser Indian traditions. The papers in this volume are presented for what they are, namely, the papers of a conference designed as a serious, but preliminary investigation of the topic. They do not provide an adequate, balanced, or definitive treatment of the subject, an achievement that must await considerable further investigation and reflection that hopefully will yet be done in India, Japan, the United States, Canada, and Europe. They vary in their degree of scholarship and level of understanding of the various intellectual traditions, as might be expected. They are, nevertheless, generally quite provocative and informative. 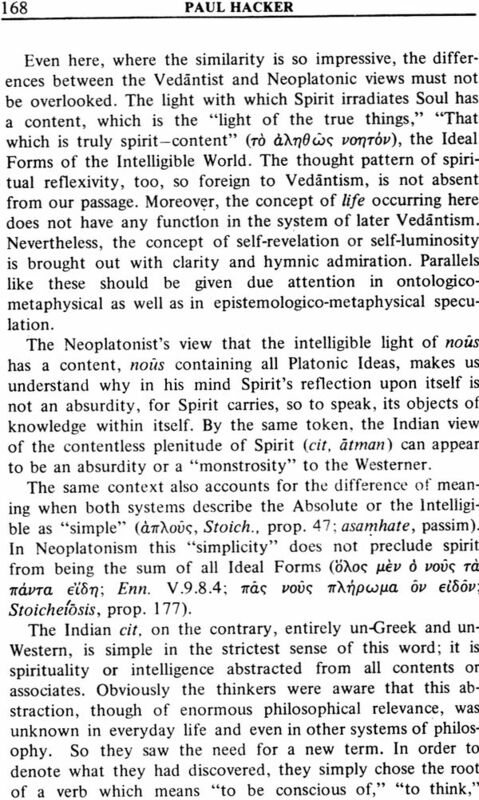 They should be particularly useful to those students who have a limited knowledge of either Neoplatonism or the various Indian traditions and who would benefit from a selective reading of essays which present them on various levels of sophistication. It is the hope .of the editor that this volume will succeed in stimulating further interest in the study of the affinities of Neoplatonism and Indian thought and will lead to additional scholarly research on the subject both in the East and in the West. While the present volume is an edited record of the proceedings of the Second International Congress of the International Society for Neoplatonic Studies held at Brock University in St. Catharines, Ontario in October, 1976, it is also much more than that. 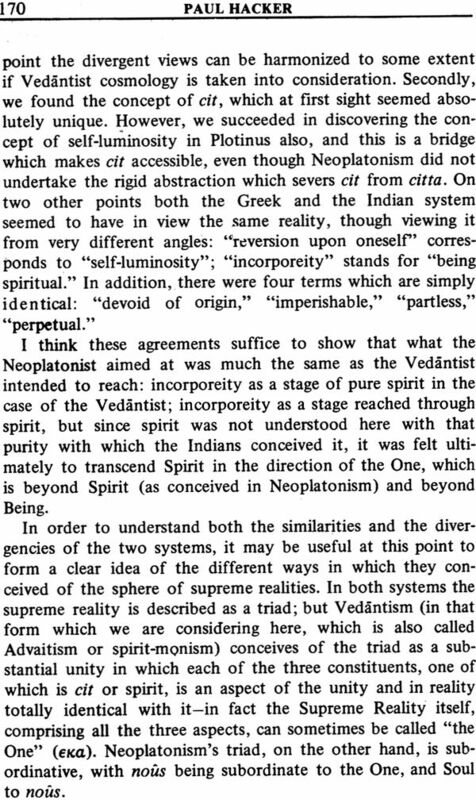 The Congress had for its theme Neoplatonism and Indian Thought, and this for very good reasons. Firstly, it is the view of the organizers of the meeting that comparative philosophy is a field of study to which far less attention has been devoted than it warrants. Philosophical development can be understood not merely as innovation, the invention of new and heretofore unthought of systems, methods and views, but also as recovery of that wisdom from the past whose significance has become lost, occluded from view, due perhaps largely to the gradual transformation of the meaning of key terms in the language in which it was transmitted. Secondly, throughout intellectual history there has been an interplay between the unitive vision which has provided a harmonization of contrasts, revealing the disparate and seemingly disjointed aspects of experience as grounded in a common matrix, and the analytic scrutiny which searches out contrasts, criticizes, defines and dissects. 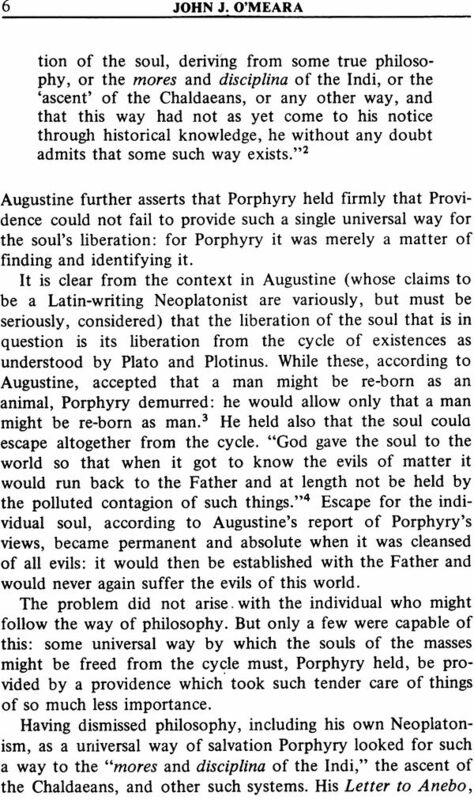 The contemporary world is largely fascinated with this latter act, while the Neoplatonic tradition invites the contemplative development of the former state. 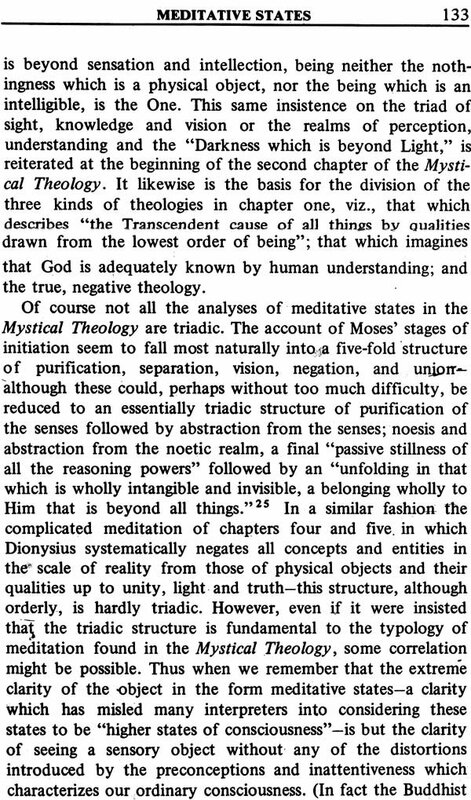 It is clear that the Neoplatonist understands his tradition as a healing alternative to the fragmented dualisms, pluralisms, apperceptions of the world as chaos, disorder and randomness. This volume, then, is not merely a scholarly report, although it is that, too, but an occasion to draw attention to an often ignored but important tradition. This book, then, also proposes to be a partial response to the above call. Neoplatonists today can be divided into two groups, with a number of individuals who fit both categories. On the, one hand we have the scholars of the tradition, people interested .in the reconstruction and interpretation of the texts of ‘ancients, such as Plotinus or Proclus, or of more recent Neo- platonic authors. On the other, there are those who recognize the perennial value, and hence modern-day relevance, of a monistic, non-materialistic, mystically inspired, but intelligently developed and cogently presented system of thought. They yearn to express such a worldview engagingly so as to bring to a world dominated by materialistic, pluralistic, relativistic and nihilistic philosophies the challenge and inspiration of an entirely differently textured approach to the nature and meaning of experience-both mundane and contemplative. Most contemporary thinkers are firmly rooted in their conviction of the ontological and metaphysical primacy of-the empirical, sensory and common-sense domain. Life, consciousness, and world-process are understood as composed consequences of insensate ingredients. To this Neoplatonists counterpose the image of a Source, from Whose transcendent integral center all lesser and determinate forms of being emanate. Of course there are individual variations and differences in just how such adumbrations are presented by different individual authors. But it is the concern of the second group to develop interest in this tradition in order to evoke by means of new and felicitous formulations the recovery and re-living of the existential basis of the insights of the ancient sages. It is salutary to discover that the non-dual tradition has pad a flowering not only in the 4th and 5th centuries of Western thought, but has had remarkable expression and influence on the culture and civilization of India. While the probability of occasional cross-fertilization of ideas cannot be ruled out, it is nonetheless safe to say that Eastern and Western scholars, sages and seers developed similar philosophies and claims largely in isolation one from the other. Their frequently identical metaphors and similes, therefore, confirm the parallel character of their traditions. 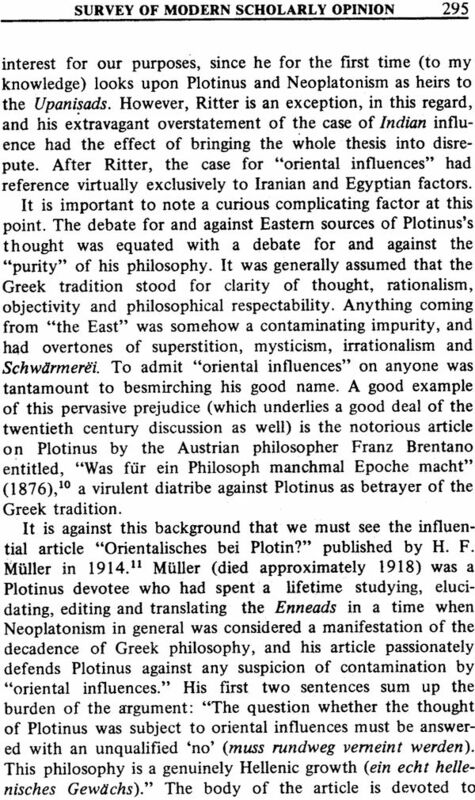 The general intellectual climate is not sympathetic today to the Neoplatonic tradition. And yet, one can find evidence for the persistency and appeal of the tradition in our own days. Apart from scholars, Aldous Huxley and Christopher Isher- wood could be named as influential literary masters commit- ted to this heritage, as well as the countless young people, who seek to give content and meaning to their lives by under- standing its objective as the reunion of the separated individual with his original source, by means of devotion, purification and compassion. Thus, this volume is presented not merely to the world of scholars, but to the serious layman, to whom it can provide in addition to information about the past, glimpses of that future in which educated men and’ women will consider as their own not only the narrow confines of the mainstream of their immediate culture, however productive, but rather, the breadth of the adventures of the human spirit, throughout history. In fine, the organizers of the Congress, the officers of the International Society for Neoplatonic Studies, and the contributors to this volume wish to express their gratitude for the support of those agencies and institutions without which neither the Congress nor this volume would have been possible. Notably, the Canada Council, the Universities’ Grants Commission of India, Brock University and Old Dominion University should be specified, although many other Universities assisted by enabling their faculty to participate.